Natl. Cact. Succ. J. xxv. 71 (1970). Oreocereus hempelianus FK 347 (Collector Friedrich Kattermann) Parinacota, Zapahuira, Chile, 3658m. Altitude range: 2,500 to 3,500 metres above sea level. Habit: The species grows in Andean shrubland on rocky and sandy soils where is locally abundant and frequent. A portion of the southern subpopulation (Oreocereus australis) is threatened by the construction of a dam. Illegal extraction at a local level is a minor threat. 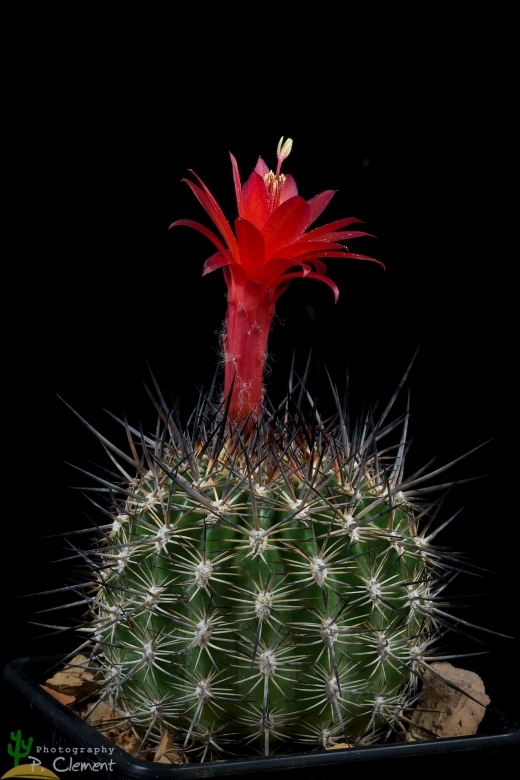 Description: Oreocereus hempelianus (Best known as Arequipa hempeliana), is a short cylindrical cactus with dense short brown spines and bright purple/red flowers when mature. This species is quite variable in spination and has received numerous unnecessary names of no botanical value, representing no more than local phenotypes. Habit: Simple or clustering from base with age. Stem: Spherical at first becoming elongated and eventually short-cylindric with age, erect or decumbent up to 30-40 (rarely 60) cm tall, 10-15 cm across, usually greyish-green or glaucous green. Ribs: 10-20 flattened and large, 5-15 mm distant. Spines: Very variable yellow to reddish, becoming dull grey. Central spines: (1-)3-6(-10), up to 5 cm often curved, whitish, brown or nearly black, flexible. Radial spines: (8-)10-15(-30), 1-3 cm long, needle-like to finely bristle-like, diverging, yellowish to glassy white. Flowers: Arising near apex, 5-7,5 cm long, 2,5-3,5 cm across, scarlet to purplish red, tube slightly curved, open to one side, the scales densely and softly hairy in the axil, limb more or less oblique, the segments acute. Fruit: Barrel shaped to ovoid about 1,5-2,5 cm in diameter, yellowish, thin-walled, opening basally.